Located right on the beach, with no public access for miles, our beach shacks will reconnect you with nature. The big shack is great for large family holidays, while the small shack is the perfect cosy retreat for couples. Both shacks have a well equipped kitchen, dishwasher, quality linen and a double sided fireplace onto the deck. 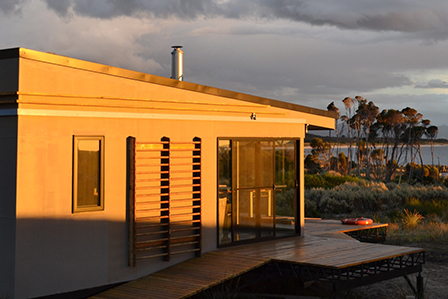 The shacks are energy efficient, with solar and wood fire heating, a large open plan living area with decks on three sides, and expansive views across Bass Strait, Mount Strzelecki and the outer islands. 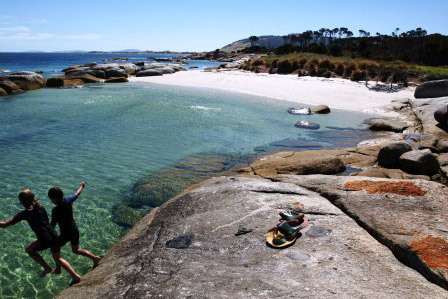 We are isolated on rural land, on a safe, calm water beach . We are a 10 minute drive from the airport and 15 minutes from Whitemark (the main town). Being centrally located on the west coast, we are within 40 minutes drive of anywhere on the Island. There are no on site managers, so you can enjoy your holiday in absolute solitude! For couples and small families we have the two bedroom shack (sleeps up to 5 people). The larger three bedroom shack is available for families and larger groups (sleeps up to 8 people). Architect designed, with decks on three sides and a wall of glass fronting Bass Strait, Sawyers Bay Shacks is the ultimate accommodation for your Flinders Island adventure. 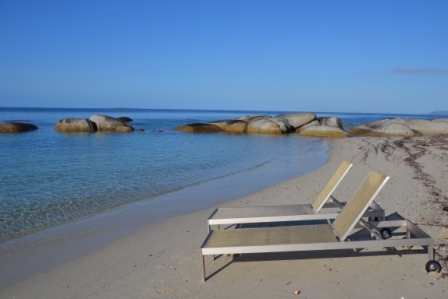 There are many amazing beaches on Flinders Island but all the shots here are taken on our own beach which was recently nominated by the Age as Australia’s top secret beach.